China orange peel aluminum sheet is one of the most wide used embossed aluminum sheet. It can also called as orange peel aluminum embossed sheet or orange peel stucco aluminum sheet. 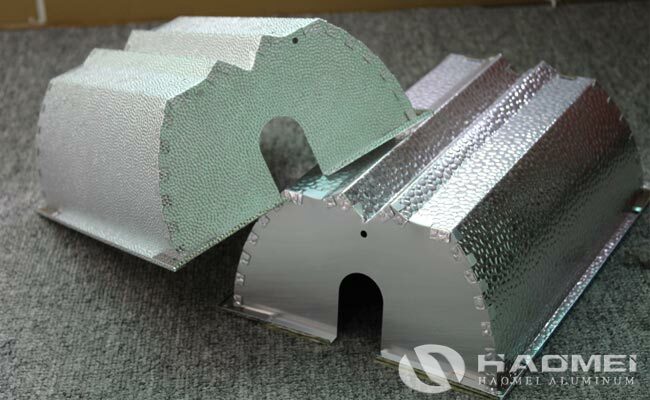 The stucco embossed aluminum can be applied in shipbuilding, electronic products, wind turbine products, machinery, building curtain wall, aluminum products processing industry, construction, packaging, air conditioning, refrigerators, solar energy, and can also be used in power plants, chemical and petrochemical plants anti-corrosion insulation, etc. To the specification, the orange peel aluminum sheet has grade of 1070, 1060, 1050, 1145, 1100, 3003 and 5052, among the grades, 1000 series pure aluminum are usually used. The tempers have H14, H16, H18, H24, H22, etc. The thickness is 0.25-1.0mm, the width is 1000-1250mm, the product can be rolled in coils or in sheet type. China orange peel aluminum sheet has application in the industry of refrigerator, lampshade, solar thermal storage board, decorative crafts, gift box billboard. In addition to ordinary embossed aluminum sheet, there is another popular embossed aluminum sheet in recent years, that is mirror embossed aluminum sheet which is used in lamps, the pattern have orange peel and pearl pattern. While applied in reflective lamp cover in camera, the pearl pattern polished aluminum embossed sheet shows its advantages.